Help your favorite plants form strong root systems by starting them in the Esschert Design Tall Hardwood Cold Frame Grow Box. Using a cold frame to start your seedlings and cuttings offers them a lasting and protected growing area, helping you create a beautiful and healthy landscape. The three, slatted wooden shelves each measure 21.75" wide and 20" deep, for plenty of room for your potted plants. A wooden back and frame support these shelves, while glass panels form the walls of the box. The hinged, front panel creates a door, for you to easily add or remove plants, and the pull knob makes access simple. The top lid angles downward, and allows light to reach your flowers all day. On warmer days, this cover can be propped open with its metal stays, circulating fresh air around the plants. The slatted shelves keep water drained from the pots, and the deep brown color enhances the area. Its innovative design allows this unit to fold flat for seasonal storage, and the legs elevate it from the ground. Place the box on a level surface in your backyard or on your patio for easy access when time to plant. 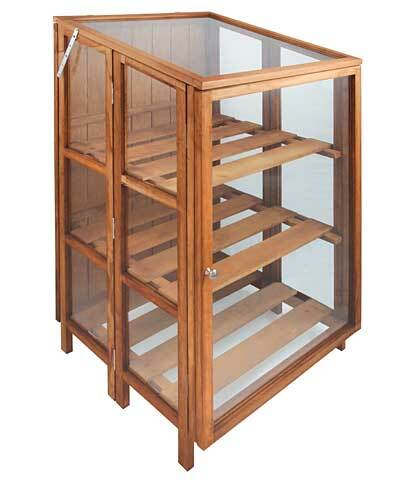 Extend the growing season for your favorite vegetables or flowers with this Tall Hardwood Cold Frame Grow Box. Some assembly required.